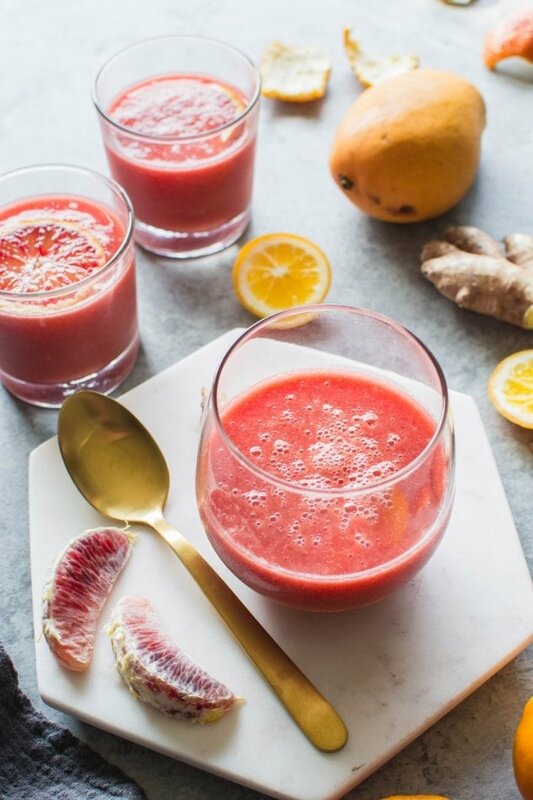 This blood orange sunshine ginger mango smoothie is made with juicy blood oranges, sweet ripe mango, bright lemon, zippy ginger and hydrating coconut water. The perfect in-between-seasons smoothie! Full of sweet and bright flavor and good for you vitamins and minerals. So techinically, it’s spring, right? But technically doesn’t mean much when it’s been cold, gray and raining for the past 3 weeks . I mean, you’d think mama nay nay would be just as ready as us to see the sunshine and the flowers, but I guess for now she has other plans. But even if the sun isn’t shining, I’m going to pretend that it is by drinking all of these blood orange sunshine ginger mango smoothies. 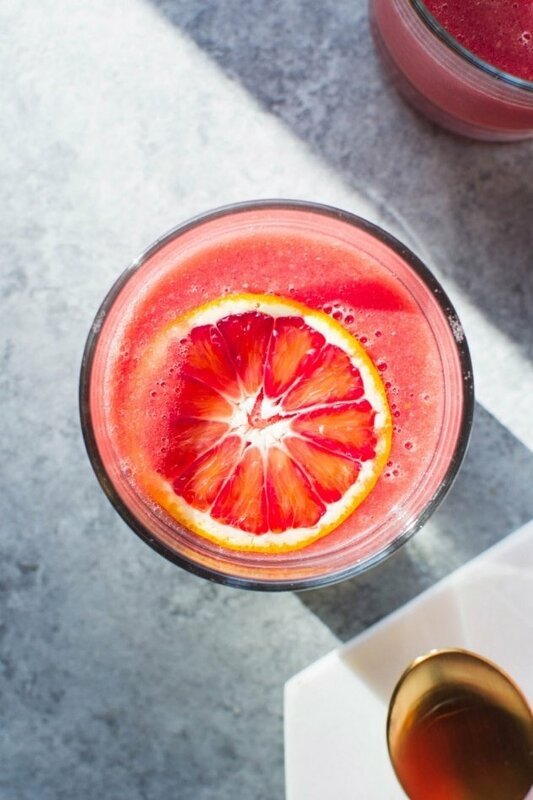 Because they are full of all the good fruit that’s in season right now, and pretty much = sunshine in a glass. Which, second to actual sunshine is not a bad option. I’m not sure what it is but I have just been feeling the whole citrus smoothie and drink vibe so hard this winter / spring. There’s something about including the pith that adds such a nice layer of flavor and texture – not to mention extra nutrition! 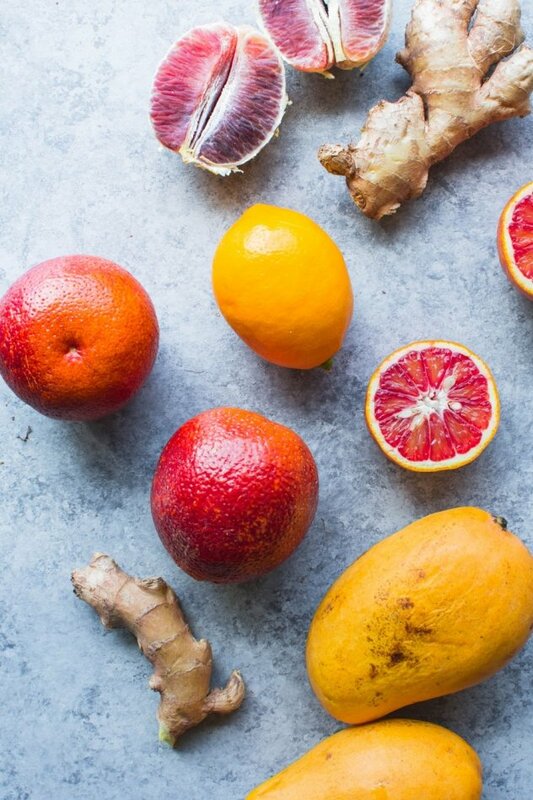 But let’s talk about the fruit that’s involved in this citrus smoothie recipe for a second. Has anyone else noticed how totally insane the blood oranges and mangos (specifically the honey / atlaufo mangos) have been this year?! I couldn’t even count the number of heavy little brown bags of these that I have brought home and tucked into our fruit bowl for smoothies and snacking. This smoothie isn’t really the meal replacement type of smoothie. It’s lighter than that, and leans more towards the refreshing icy beverage side of smoothies than the hearty and filling side. It’s worth making alongside some eggs or with a handful of nuts for an afternoon pick me up. Mango – Honey mangos are best if you can find them. They are SO sweet and juicy! They’re the yellow to golden hued variety with a smaller shape. Tip: Buy extra for snacking! You’re going to want to have them around. Blood oranges – My local Whole Foods has been carrying some on the larger size, about the size of a tennis ball, and my recipe calls for two this size. But if you can only find a smaller size, I’ve also included a quantity for that size. 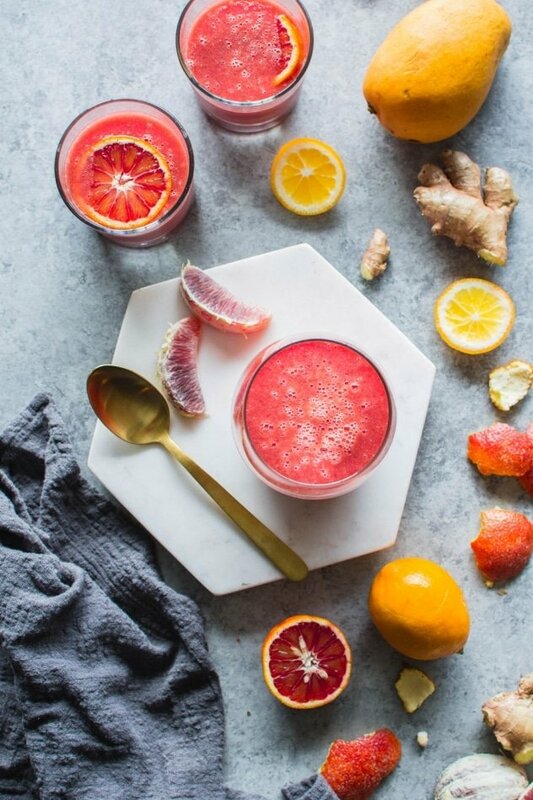 The darker the color the more ruby in hue the final smoothie will be  Also, if you can’t find blood oranges regular oranges will work absolutely great, too. The color will just me more orange than pink/red. But still delicious, which really is the most important part anyways, right? Meyer Lemon – You don’t need to use a meyer lemon, but it does add a nice floral element, if you tried meyer lemons before you know exactly what I mean. A regular lemon will work just fine, although if you are using a regular lemon maybe only use half, as they’re more tart than meyer lemons. 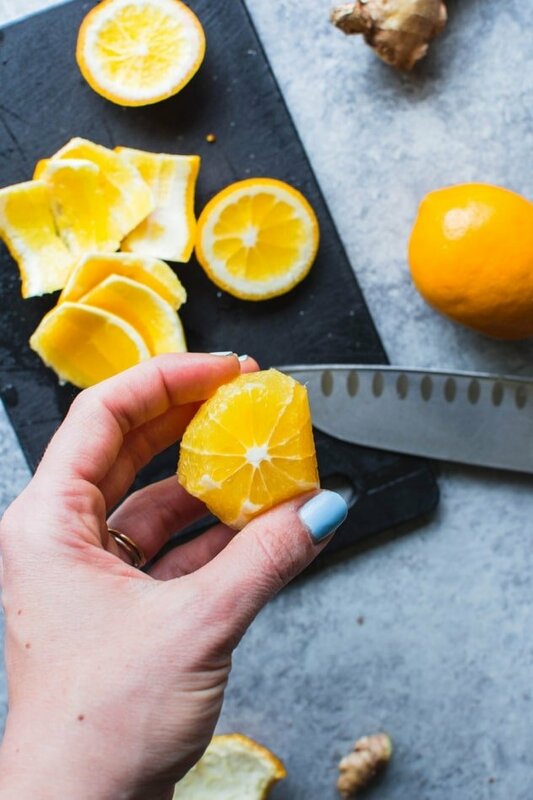 You could also leave out the lemon all together for a sweeter smoothie, but I love the bright tartness that it adds – not to mention the extra dose of vitamin C! Ginger – The fresh ginger really ties the whole thing together. I was actually struck by the idea for this recipe after having a green smoothie that was made with OJ, mango, ginger and a bunch of green goodies. 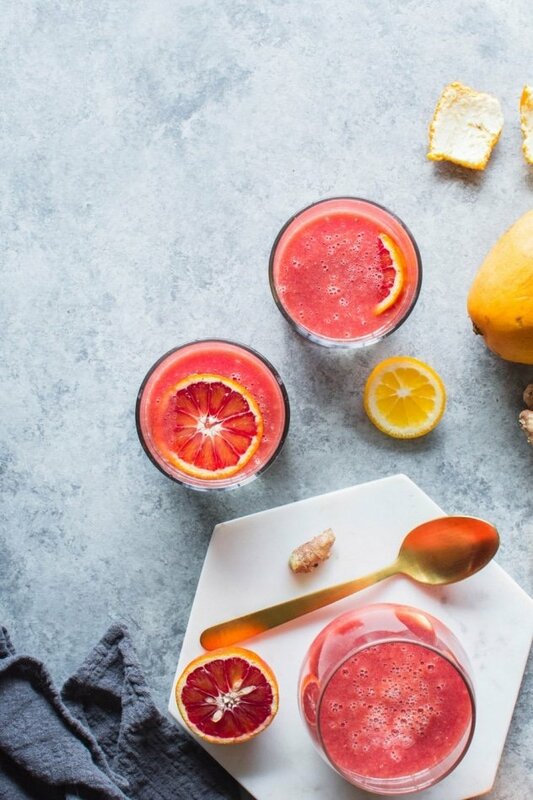 The sweetness of the mango (and in this case, also the blood orange) is just perfect with the spicy bright bite of fresh ginger. You can adjust the amount to suit your personal taste for ginger. Some like it hot, some not so much, ya know? Coconut water – My favorite smoothie base besides nut milk. Coconut water for icy fruity and green smoothies, and almond milk when you want some rich and creamy satisfaction in a smoothie. Ya with me? Coconut water just fits here. My personal favorite brand is Taste Nirvana. If you guys haven’t tried it, you are missing out! Even people who don’t like coconut water are way into this coconut water. 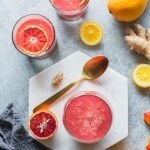 Bursting with sunshiny seasonal fresh citrus and mango flavors and brightened up with some fresh lemon and ginger, this smoothie is destined to bring some happy vibes to your days as we wait for the sunny and warm days! Add all ingredients to blender and blend on high for about a minute, until smooth and no pieces of ginger or fruit remain. This entry was posted in drinks and tagged blender, citrus, easy, ginger, gluten free, grain free, healthy, mango, paleo, quick, smoothie, vegan, vegetarian, whole30 on April 6, 2018 by Nyssa Tanner.